Cape Town - Orlando Pirates went top of the Premiership table after edging Cape Town City 1-0 in a pulsating match at the FNB Stadium on Tuesday night. 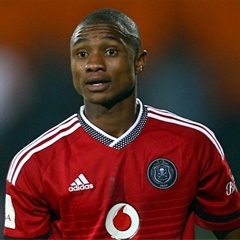 The Buccaneers showed good purpose with their early play and had two excellent chances in quick succession around the 11-minute mark, but Thembinkosi Lorch was denied by Shu-aib Walters after going clean in on goal before Musa Nyatama blasted the ball over the bar from right in front of goal. There was an effort on goal for the Citizens on 16 minutes when Lyle Lakay hit one from range, but home keeper Wayne Sandilands did well to make the save, while at the other end the lively Bernard Morrison was twice denied by Walters. Benni McCarthy's side thought they had taken a 34th-minute lead when Lehlohonolo Majoro bundled home a cross from Lakay, but he was adjudged to have fouled Sandilands in the process and the goal was disallowed. City had the first look in on goal after the restart, but Majoro headed a difficult chance wide on 50 minutes. Pirates, however, began to find some an extra edge to their play and they were close to taking the lead 22 minutes from time when Thabo Matlaba made space in the box before stroking a shot inches wide of the right-hand post. Chances continued as teenage substitute Lyle Foster burst down the right-hand side of the box, but had his cross cut out by a defender, while at the other end Lakay squandered a chance when he tried to pick out a team-mate rather than shoot. But it was the Sea Robbers who were to make it count when Foster's cross nine minutes from time was allowed to reach Qalinge at the back post, where he just managed to slide the ball over the line. The hosts were able to hold on for the win without too many problems as they made it three wins and two draws this season.